Maynard Dixon Country Visit was FUN! This year I planned ahead and 'stopped in' to Maynard Dixon Country ahead of the events so that I had time to paint! It was great as the scenery is stunning. But, better yet, I had many painting questions lined up for the spectacular opening at the Thunderbird Gallery in Mount Carmel, Utah! 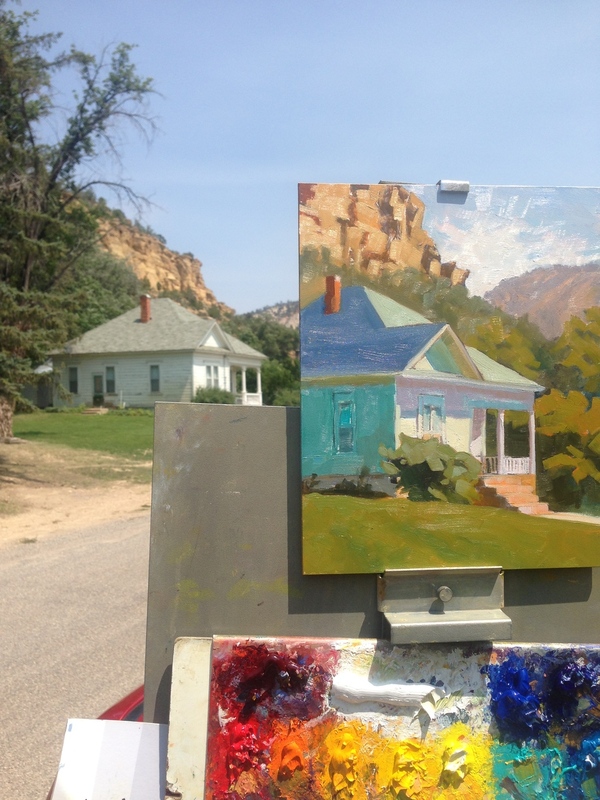 I could hardly wait to see how the invited artists took on the challenges of painting these views... and was I thrilled to learn from all of their work and get to ENJOY every painting... not to mention the artists themselves! It was, indeed, like a candy store! The temperatures were hot which was a new challenge for someone who lives in high elevation mountains. I even got to use my umbrella... which I definitely need a better set up for! The evening light and cast shadows on the cliffs is nothing short of breathtaking! There was one day that was a bit smoky so I decided to avoid a longer vista. I found this house nearby in Orderville. I was intrigued with the contrast of the dramatic red sandstone backdrop for this charming little Victorian home. I thought about what it must have been like to arrive here and build this home so long ago! Some days I just plain ducked into shade wherever I could! I have not had opportunity to work with these studies yet, but learned so much from working in this environment prior to seeing the show... what an opportunity! The weekend was all that I hoped it would be with a symposium started by Hal Cannon reciting poetry and singing in his storyteller style followed by a presentation by Jill Carver and Ralph Oberg. Guest artist Robert Goldman was there along with the many invited artists who's skill and sensitivities are mind boggling! The Thunderbird Gallery Show and wet paint show were both spectacular! Add a little socializing, great food and music and you know you have arrived in heaven! Susan and Paul Bingham are to be acknowledged in this and other Thunderbird Foundation events. They are passionate, organized and FUN! Thumbs up to them!